Deciding to Retire With High Market Valuations And Low Interest Rates - Can I Retire Yet? A combination of high stock valuations and low interest rates creates a challenge for investors contemplating where to deploy their capital. This environment is especially scary for those approaching retirement, worried about retiring at the wrong time. Many contemplate working one more year. Despite recent market volatility, stock valuations sit near all time highs. Higher stock prices historically mean lower dividend yields and a pessimistic outlook for future returns. This leads to increased sequence of returns risk, the risk of your portfolio being depleted in the early years of retirement to the point where it can’t rebound to fund the later years. Simultaneously, interest rates remain low by historical standards. Low bond yields create little income, while increasing interest rate risk and inflation risk. Investors are increasingly looking to real estate investments as an alternative to overpriced stocks and bonds, pushing real estate prices higher as well. I recently made the decision to retire early. This required assessing different strategies to manage increased risk associated with retiring in these challenging economic times. Many point to high stock valuations as a sign that a crash is imminent. These same arguments were being made in the early stages of an extended bull run when I began getting serious about planning my retirement in 2013. In the 5 years from March 2013 to March 2018, the S&P 500 returned 76.6%. With dividends reinvested, that number jumps to 94.3%. Ben Carlson, CFA, shares insight into using historical market valuation data to provide actionable portfolio advice. He notes that high market valuations are correlated with lower average returns over subsequent 3, 5, and 10 year periods. But, there is a lot of variability. Carlson’s conclusion is that market valuations are poor tools to try to predict and time market crashes or the path of returns. Trying to time the market is risky. Imagine deciding in 2013 to sit out of the market, waiting for prices to fall. Similarly, imagine putting off retirement because you were afraid a crash was imminent. Similar to stock valuations, there is consensus that bonds are expensive. Nearly everyone predicts interest rates must go up. But know one knows how soon or how fast. The ten year treasury rate has not gone above 3% since June, 2011. Todd Tresidder wrote “The Great Bond Bubble is Now” (emphasis on “now” is mine) in March 2013. None of the fundamentals he wrote about have changed substantially since that time. Rates have increased less than one percent over the past 5 years. We sense stocks are overvalued and will correct, but we have no idea when or how this will occur. Interest rates and bond valuations are easier to understand, but timing when and how they will change is equally daunting. If you’re waiting to invest money in a market you think is overvalued, ask yourself at what value you will be comfortable investing. How long are you willing to sit on the sidelines waiting for the markets to drop or rates to go up? What is the opportunity cost if this takes a year? Or five years? Or it never goes that low? If you’re thinking about taking chips off the table because you believe a market is getting overvalued, your job is even more difficult. You’ll have to time the market correctly twice. At what level is the market so expensive that it warrants getting out? Even if you get that right, at what level do you get back in? Market timing is a loser’s game for the average investor. It is best to avoid market timing. But sometimes you can’t. 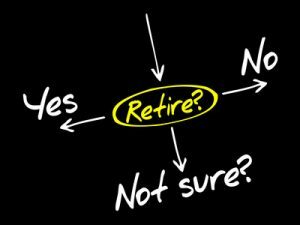 Deciding when to retire is the ultimate market timing decision. Traditional retirement requires deciding when you have enough income to live comfortably. You need to make a decision that you can stop accumulating a portfolio and start spending it down. You can do everything in your power to make an informed decision. But ultimately, you are still subject to luck. It’s easy to look back five years, when market analysis was similar to that facing those contemplating retirement today, and know what the right decision was. But the past does not predict the future. The next five years might continue on the same trajectory. Or, there could be a massive market crash tomorrow followed by a reasonably fast recovery. More damaging would be a correction followed by a prolonged bear market. We just don’t know what the future holds. A general rule of thumb for retirement planning is to start with the 4% rule. This assumes you can withdraw 4% of your portfolio balance in your first year of retirement and then continue taking this amount for at least 30 years, adjusting annually for inflation, without exhausting your portfolio. Using these assumptions, you would need 25 times your annual spending to begin retirement. A household spending $50,000 per year would need $1.25 million. Retirement researcher Wade Pfau writes in Forbes that in this high valuation, low interest rate environment, a 3% withdrawal rate gives a chance of success similar to findings of historical data that produced the 4% rule. Using a 3% withdrawal rate means you would need 33 times your annual spending to begin retirement. For someone spending $50,000/year, this increases required savings to $1.65 million. Ultimately, we don’t know what we don’t know. We can’t determine our “correct” withdrawal rate until after the fact. Using a 3% withdrawal rate may be far too conservative. Or it could still be too aggressive. Any strategy that involves selling off assets is essentially a game of chicken, because your portfolio could be exhausted before you die. Financial Samurai argues the only truly safe withdrawal rate is one which does not touch principal. I am financially conservative and have a long retirement horizon, so I ascribe to this line of thinking. But with dividend yields and interest rates so low, how much more more do you need to save if you only want to spend dividends and interest produced by your portfolio, without touching principal? The current dividend yield for the S&P 500 is now less than 2%. This means you would need an all stock portfolio to be more than fifty times your annual spending to start retirement. The current rate of a ten year treasury is approximately 2.8%. This means you would need a bond portfolio value greater than 33x your annual spending to produce enough income to live only on interest without needing to sell any bonds. If we assume a portfolio of 50% stocks and 50% bonds, the yield would be under 2.5%, meaning you would need a portfolio value greater than 40 times your annual spending to start retirement with a truly safe withdrawal rate. For someone spending $50,000 annually, this would require saving over $2 million, compared to $1.25 million suggested by the 4% rule. Early Retirement Now (ERN) published original research suggesting that sequence of return risks for early retirees could be reduced by utilizing an equity glidepath. His finding showed optimal financial outcomes were obtained starting with a portfolio of 40% bonds and 60% equities and systematically increasing equity exposure to 100% over time. This strategy decreases sequence of return risk by lowering equity exposure in the early years of retirement. It also allows for portfolio growth to sustain spending and match inflation over the 40-50 year retirement timeline possible for an early retiree. ERN’s work is built upon similar findings by Michael Kitces in research based on a traditional retirement timeline. An equity glidepath is compelling. But this strategy is not foolproof. Nor is it a free lunch. If market returns are high early in retirement, ending balances will be less than with a simple static portfolio. The research from ERN suggests not exceeding a 3.5% withdrawal rate in these times of high stock valuations. A .5% difference in withdrawal rates translated into dollars means a household spending $50,000 per year would need $1.43M to begin retirement. This requires an additional $180,000 savings compared to the assumptions using a 4% withdrawal rate. Running out of money is obviously a massive risk when making your retirement decision. But it’s not the only one. If you are contemplating early retirement, it’s safe to assume you’re not doing the thing you most want to be doing with your time. There would be no reason to take the financial risk of retirement if you were happy with your current lifestyle. If you’re trading time for money, it’s important to look at what you’re getting in return for making that trade. Is it worthwhile to work longer to save more for retirement? Retiring when valuations are high and interest rates are low is risky, but what if we flip the equation? Isn’t it also risky to trade your time for money, when that money is being used to buy investments that are poor values? How much longer would you have to work to save an extra $100,000? Is it worth it to trade that time for an asset that will pay you only $2,000-3,000 per year? Would it be easier to go out and earn an extra $2,000-3,000 per year in retirement? Our strategy was to choose a non-traditional retirement. This allowed us to hedge our bets. It also freed up time to pursue a more active investing style in retirement that should enable us to achieve higher returns than we could get with passive investments. Our first strategy was to have some ongoing earned income that would insure we could live off income (dividends and interest) produced by our portfolio without touching principle. This would allow us to have the best of both worlds. We could get many of the benefits of retirement, while eliminating sequence of return risk and the accompanying stress. Some may say this is “not really retiring”, because it requires ongoing work. Let’s explore. We began with the assumption we needed 25 times our annual spending to retire. Our portfolio is heavily weighted towards equities, so we used 2% as our “true safe” withdrawal rate. This means we would need enough income to produce the other 2% until our portfolio grew. Our annual spending (with paid off mortgage) is about $50,000 per year. This means we would need to produce an after tax income of about $25,000 per year, or roughly $2,000 month. We discussed several options. When we began planning, our first option was for me to maintain my physical therapy license and work 3-4 months of the year doing traveling assignments. Another option was having my wife do consulting work. We also discussed each of us doing simple, low-stress jobs that would produce income and simultaneously decrease expenses. An example would be working part-time at a ski resort to produce income and simultaneously cut spending by getting free season ski passes. Retiring early requires a high savings rate to accumulate wealth. This means most people contemplating early retirement have some combination of relatively high earning power and low expenses which allow similar options. I decided to retire early as a physical therapist. My wife continues to work 30 hours per week in a location independent job that she enjoys. This gives us financial security, providing most of our living expenses and our health insurance. This is more than we planned for either of us to work, but it gives us a great lifestyle with a lot of flexibility. It’s worth noting that she would likely not have taken this position if we were committed to a traditional retirement, because it was a risk to leave her previous job. She made a lateral move from a secure position to her current position as the seventh employee for what was a brand new company. The appeal was the potential of having employment that offered location independence. When earning a reasonably high salary and investing regularly, low cost index investing can be an effective tool to passively grow wealth. I followed this approach when a combination of full-time work and personal interests dominated my time and mental bandwidth. We are not limited to investing only in publicly traded stocks and bonds. We also don’t have to limit ourselves only to passive income from stocks, bonds, annuities, social security, pensions, etc. to fund our retirement. There are other options with higher potential returns. Once freed of the demands of work, I have more time to pursue investing strategies that can produce superior financial returns. This also provides non-financial benefits such as mental stimulation, social interaction, and a sense of purpose vital to a retiree. I plan to pursue two such paths of active investments in retirement. Real estate investment trusts (REIT) enable passive investing in real estate, but they are subject to the same market dynamics as publicly traded stocks and bonds. Comparing privately held real estate to publicly traded funds is like comparing apples to oranges. Investing in individual properties allows an individual investor more control over their investment outcomes. It’s a mix of business and investment that can allow lifestyle flexibility while providing outsized returns. I asked real estate investor and educator Chad Carson what the minimum return he would expect to entice him to invest in rental property. He would “look for a 6% return or better for a cap rate (i.e. income return if I paid cash) on a quality single family house. A commercial property or apartment building would need to be even better – in the 8 to 10% range.” This means a $100,000 real estate investment would be expected to produce $6,000-$10,000 income per year after expenses, compared to less than $2,500 for a 50/50 stock/bond portfolio. Income is only one way to make money on an investment. Carson uses the acronym IDEAL to explain the different ways real estate investors make money. Income: From rent or interest on private notes. Depreciation: A required accounting expense that lowers your taxable income. Equity: If buying property with financing, tenant pays for part or all of the asset. Appreciation: Real estate prices and rents tend to keep pace with inflation. You can also create appreciation by buying below market values or improving properties to increase value. Leverage: Use of debt to multiply returns. We recently dipped our toes into real estate by renting our future home in Utah for a year while preparing for our cross country move this summer. This experience has been educational. Pulling it off from across the country using a property manager showed us real estate investing can be profitable while requiring little work beyond finding a good deal on price and financing. In retirement, I have time I didn’t have when working to find real estate deals. I plan to expand my real estate investments, which I’ll be writing about as I continue to learn and experiment. Since retiring in December, I’ve been experimenting in a variety of new endeavors. One is working on this blog. Another is working on a book. Creating a lifestyle business in retirement has multiple benefits. Income is certainly one of them. Making a small income in retirement can reduce stress on an investment portfolio. A small business has other benefits as well. Creating a small business can create social connections and provide a sense of purpose. Early retirement is not all rainbows and puppy dogs. Many work hard to retire, only to experience social disconnectedness, deterioration of health, and decreased sense of purpose. A job can be a solution to some of these problems. Being your own employer can provide more control over when you work, how much you work, and what projects to pursue. Having a personal business also provides tax perks. Some personal expenses can be shifted to business expenses that offset taxable income. The computer I’m typing these words on is one example. The other benefit of having a business is you can create an asset. When you work, you are trading time for money. A job may be an easier way to make money quickly, but it requires the ongoing trade of time for money. This blog is not passive. But it does produce small amounts of income, and in the process is creating an asset that could eventually be sold. Likewise, writing a book (or creating other scalable products) is a tremendous amount of work for no immediate pay. But once completed, these assets can produce income indefinitely. A retiree has the freedom to pursue projects having potential upside without the pressure of needing immediate income or risking financial resources. Making the decision to retire is never easy. It involves making assumptions about variables you cannot know or control. You never have certainty. Current market conditions make this decision even more challenging. You can’t change the math, which can be unforgiving when small errors in assumptions can compound for decades. You either have to accept more risk or work longer to retire more securely. However, you can change how you choose to work with the math. You can escape an unfulfilling job to pursue your passions sooner if you don’t limit yourself to traditional definitions of what retirement should be and what investments you can use to achieve and navigate retirement. Thanks for including me. Chris. I find your personal story very informative and educational. First of all, you’re demonstrating flexibility by depending on different types of income. Second, you’re willing to pivot and change based on what the market is giving you (like high valuations, low income yields right now). Third, you’re not getting stuck in worn out definitions of “retirement.” The goal (for me at least) is to live a fulfilling life and use money to serve and sustain that. It’s a tricky equation to accomplish this, but I appreciate the insights you’ve shared here. I’m heavy in real estate, as you know. It’s helped me have the income I need to not actively work as much. And I plan to sort of make an opposite move – diversifying into more passive equities (over time) and also becoming a more passive real estate investor as a lender. Happy to share your work, as it has really opened my eyes to the benefits of diversifying into real estate. Agree that we need to expand our definitions and change perceptions that trap many people in unfulfilling lifestyles. I think it’s interesting that we worked to achieve FI using very different strategies, and are each continuing to learn and explore as we diversify and grow post-FI. The spammy ads on this site make the (really good) articles hard to read! They’re distracting! I don’t mind a little strip ad on the bottom of the screen, but the ones that are positioned (and big) between paragraphs of text are horrible. Do you really need these?? Do people really click on this crap?? We’re experimenting with ways to monetize the site, as it is a business as noted in this post. We were hesitant to switch from the prior advertising platform to the one we currently are using, because of the same concerns. To this point, it has produced substantially more income and very few complaints, though others may share your opinion and not voice it. We appreciate the feedback as we continue to evaluate ways to provide value to readers while making it financially worthwhile for us to devote the effort required to produce content on this website and cover the expenses associated with hosting it. I hope you’ll be patient as we continue to work on finding the right solution. Thanks again for your feedback. I don’t mind the ads at all. This is a free article to read and a couple of ads have no affect on the value of the writing. I agree the ads are much more annoying but am willing to put up with it because of the content. Don’t know if there is any extra income in it as I never click on that crap. Easiest solution is to donate money to Chris for reading his work. But, there are actually people who complain about reading and learning for free who never pay. It’s kinda crazy! However, I think any discussion about safe withdrawals needs to discuss taxes . Is your $50,000 per year example of retirement expenses after or before taxes? How does the multiplier change if retirement assets are in tax deferred or non-Tax deferred accounts? Clearly one needs a higher multiplier if all assets are tax deferred and a lower multiplier if everything is not in tax deferred accounts due to different effect of taxes on these accounts, particularly for those with higher expenses. Excellent point and one which I plan to explore in more depth in future posts. One thing to consider is the relatively low living costs of many early retirees means taxes in retirement are pretty low, particularly for those that live in states with low state income tax. Using the $50K/year example, the first $24K is tax free with standard deduction. The next $19,050 is taxed at only 10% or $1,905. That leaves $6950 taxed at 12% or $834. Total federal income tax is $2739, an effective tax rate of about 5.5%. By utilizing a mix of tax-deferred income up to standard deductions and taxable and Roth accounts above that, it is possible to pay close to $0 federal income tax. Darrow covered this topic here in more detail:https://www.caniretireyet.com/why-i-dont-fret-about-taxes/. In my research, most Monte Carlo simulations calculators peg around a 3.2% withdrawal rate for a 90% confidence of not depleting your assets in the next 50 years. And if you have some flexibility in decreasing your spend during particuliarily bad times, this confidence level can be improved quite a bit more. When you get to these levels of asset longevity confidence, I suspect other typically low risk items such as debilitating accidents/illness, unanticipated emergencies, divorce, etc. become the higher risk factors to a happy retirement. Any studies on these other factors? At any rate, we need to continually remain flexible and have contigency plans as no plan is air tight. Agree with the idea of flexibility and have built quite a bit into our plans. Not sure how you can plan for emergencies aside from proper insurance, and agree divorce would be very harmful from both a financial and happiness stand point. Excellent article and very thorough in details. As for real estate investing I encourage you to look at Real Estate Crowdfunding (https://firechecklist.net/2018/03/02/real-estate-crowdfunding/). It frees you from being a landlord and dealing with tenants BUT it pays consistent cash flow as well as a preferred rate of 8% (in addition to a conservatively estimated I.R.R. Based on proforma). This is a topic I plan to explore here in the future. I’m not so sure you can count on these rates over a long term when most of these types of crowdfunded sites haven’t been around to see a downturn in the economy. I am intrigued by the concept. Thanks for the mention. It sure seems like it’s 3am and the part is starting to fizzle out. What a bummer actually! It was so fun to make money from our investments so easily for so long. Alas, all good things must come to an end. You’re welcome. I know most in the early retirement crowd think this is far too conservative, but I think it makes a lot of sense given all the moving parts and the long time horizon. Agree it would be nice to see those returns go on forever, but all good things must come to an end at some point. Another great article Chris, well written. I’ve reached the point where I have over 35x my current annual spending saved up, so I guess I could retire with a 3% withdrawal rate. But that assumes my current spending rate will continue, which is unknown. I’m a pretty low spender – I’m no MMM but I’m more on the frugal, lean-FIRE side than most. My risk-tolerance is on the conservative side, so this suits me well. Plus I’ll also have a government pension when I turn 62 which of course will help a lot. But healthcare concerns still worry the crap out of me. If it’s one thing that could quickly bankrupt us all, it’s that. So for now I will continue my semi-retirement to keep my health coverage at my job. I think many who want to get out now but who are concerned with market valuations and sequence of returns risk should consider going part time. As you said, it’s not all sunshine and puppy dogs, but my stress has gone down and my happiness up. You make a couple key points. Much of the safe withdrawal research focuses on market conditions producing income that meets spending needs, but it often neglects the other side of the equation. Your spending needs and wants may change. The wants you can theoretically control, but it’s a different thing to be frugal as a choice and be frugal by necessity b/c you are restricted by not having enough money (or fear that you don’t have enough money). The needs, which I agree medical insurance is one, you can’t control and can vary widely. I think your risk aversion is wise (though I’m biased, b/c it is similar to my line of thinking). I think it’s also worth noting that you are so happy while working less. As disclosed in the article, our life is not how we pictured when we were both into the idea of early retirement meaning no work. We’re both working on things that interest and challenge us, albeit me for little to no money, and we have much more balance in our lives. Having my wife’s income and health insurance is a huge stress relief. I don’t know that with no work at all (and no income) we would be as happy and worry free. Yep, I agree too. I hate ads. It’s funny how Samurai says that people who read for free complain about ads. Bloggers try to teach people to save, not to waste time on junk, but then in return they expose readers to distracting stuff because they want those readers to (inadvertently perhaps) click on them so they can earn more cents per click vs. for exposure only. Readers should be made aware of the fact that even if they don’t click on ads, bloggers do earn money for just distracting them (as in trying to catch your eyeballs lol). For this very reason, I’ve stopped reading/following quite a few blogs. I wasn’t too thrilled when Darrow turned off comments but I did understand his reasons. But now it’s going in the other direction: spoiling the site with ads left and right. The best free discussions are still on the forums that are free IMO. Isn’t it funny how it turns out? You reach FI by being frugal and avoiding nonsense around you. Quit work claiming that they have savings to last for the rest of their lives and start a blog because it’s your passion, whatever. But gotta make money so they start creating and selling stuff that they were trying to avoid while seeking their own FI. Kind of smells like a hypocrisy, doesn’t it? If not, then surely it’s a delicate line for the bloggers to walk on. I started with reading forums. When blog-sphere became popular I discovered a few good ones (10-15 blogs that I used to follow) and I thought now I’ll learn something new. I’d say I enjoyed reading them for 3-4 years, but now it seems the stories are being pretty much recycled and since I’m ad-adverse that helps my decision to unsubscribe. So I’m rediscovering forums again. I think you should consult some good web designer to get a few tips. The new content is not bad but ads cheapen it. Some people don’t care. Even though I don’t like ads on Big ERN’s website but so far he’s been presenting such strong content that I attempt to ignore those ads. Being a blogger presents a legitimate challenge as to how to help and serve others while making it worthwhile to incur the personal expenses (time and money) that it takes to produce a blog. It’s easy to criticize others, but challenging to actually produce something of value that helps many people. Do you think as a reader you are entitled to expect a blogger to take hours away from family and other interests and spend thousands of dollars out of their own pocket as is needed to create content and promote it to reach a wide audience with no expectation of reimbursement for their effort? Using advertisers allows us to give away our content for free. You are not obligated to use their products or services. Darrow has written for years about taking control of your time and money, allowing others (including me) to lead more meaningful lives. This is what drew me to his work as a reader and it is at the core of the message I continue to share, writing with transparency about what this life actually looks like. Part of that transparency is admitting that I don’t know if I have enough to live forever off only passive income, and I think it is wise to create additional sources of continued income rather than living a life of scarcity or trading time for money longer than necessary in an unfulfilling job. That was the point of this post. If I was worried about making as much money as possible, I could make more working one Saturday a month doing physical therapy work than I make spending a few hours every day working on the blog. I’ve chosen to spend a lot of time to help others by educating them on financial issues and sharing perspective that few people understand. I do this for very little money. I think that qualifies as it being my passion. You’re entitled to your opinion. If you feel the need to publicly share that opinion here to call me a hypocrite, I take exception. Hope you are doing well.. I enjoy reading the articles. I’ve been exploring close-end-funds that pay out 6-8% dividend (e.g. Blackrock, Eaton, Cohen and Steers etc.) and I’m wondering if that is something you have ( or anyone has) experience with.. Thanks in advance..
I’m not an expert by any means, but I am weary of these types of investments. A few questions I would ask before investing is how they can produce such outsized income returns in these low yield times. I would assume they are increasing investor risk (i.e. investing in lower rated bonds, using leverage, etc) to pay the outsized dividend. Also I would want to know what the fees are for these actively managed funds b/c performance can go away, but fees generally won’t. I’ll look into them more as a potential topic for a future post, but not high on my list of things that would likely be a useful tool for many readers. Reading the article I haven’t even noticed the advertisements some people complain about:Excellent column!!!. Diversifying in real estate is without any doubt a great option: We have two rental properties that generate around 7% rate of return after expenses( and pegged to inflation), of course there is some hands on activity, but Hey! you are already retired! If you can cover essential expenses with social security plus sideline source of money like this (assuming you are close to collect SS) the discussion of 3%, 4% or whatever % is hollow: you are fine. Thanks for the positive feedback Luis. Agree that this is an interesting path that I plan to explore further. As noted in the comment above regarding closed end funds, there are no free lunches. The trade off with real estate is that it is not a passive investment, but as you note with good risk management and increased time to devote to this type of investment, out sized returns are very realistic. I think you need to check your math in the lowering expectations section. You state a 4% withdrawal rate requires a $1.25M nest egg and a 3% rates requires $1.65M? I don’t think so, not unless you are also changing the life expectancy! I understand the original assumptions of the 4% rule are based on a 30 year time horizon, which in addition to current valuations is a reason I think it’s a bit aggressive. That said, if you look at the math, if you get good returns early in your retirement, your portfolio will grow and last well beyond 30 years. If you get bad returns early on, you may not last 30 years. All this assumes your spending stays constant as well, adjusted only for inflation which I think often gets overlooked, or at least underestimated given the uncertainty in health care. If valuations are high, the problem is it is likely you will get subpar returns which combined with your spending depletes your portfolio to a degree that it can’t recover. If valuations are low, odds are returns will meet or exceed historic returns and that is the ideal time to retire (in theory, there are no guarantees). Very interesting article thanks 🙂 I’m so far from retirement this is not yet a real concern of mine. However, the SWR is very important. Personally, I’m going with safety with 3.5% WR, but this should be reviewed over time. I also like the concept that retirement should not touch the principal. However, this means a lot more money to accumulate. Adding some side incomes will help a lot. It’s great that you’re thinking about these things so far out from retirement. Plans, perspectives, and situations on the ground are bound to change many times. By the time you retire, maybe valuations and interest rates will be more in line with historical averages and you’ll feel comfortable with 4%. Agree that not touching principal means saving much more if bound to retiring to a life of no further work and no further income, but adding small amounts of sustainable income can drastically change the equation, allowing retirement sooner and/or with more security.